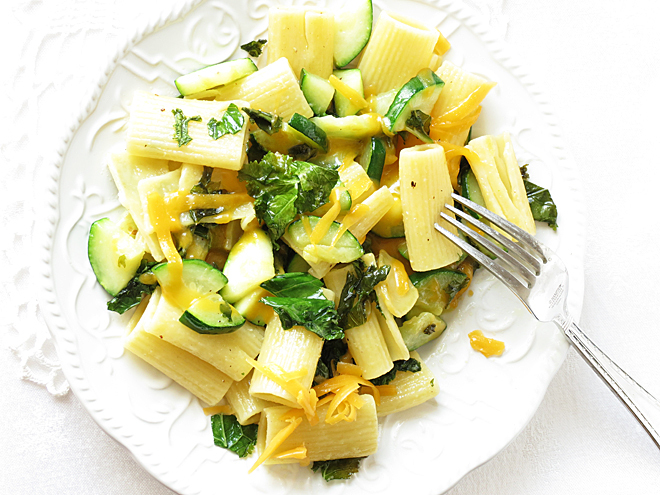 Today’s delicious kale pasta with zucchini and shredded cheddar cheese is courtesy of our contributor Ilona from Ilona’s Passion. After browsing recipes on the internet I stumble upon on “kale”. I have to admit I’ve never had a kale until recently. I’ve never bought before and never tried it. However, after reading all about kale how good it is I’ve decided to try. It was an impulse at the store. I saw it and I bought it. It was in organic store and this time of year kale is cheap. After coming home I didn’t know how to eat it raw or cooked. I checked Pinterest for that and I quickly realized that you can eat raw or cooked. I wanted to try both ways. So first recipe I did was a smoothie from the raw kale. 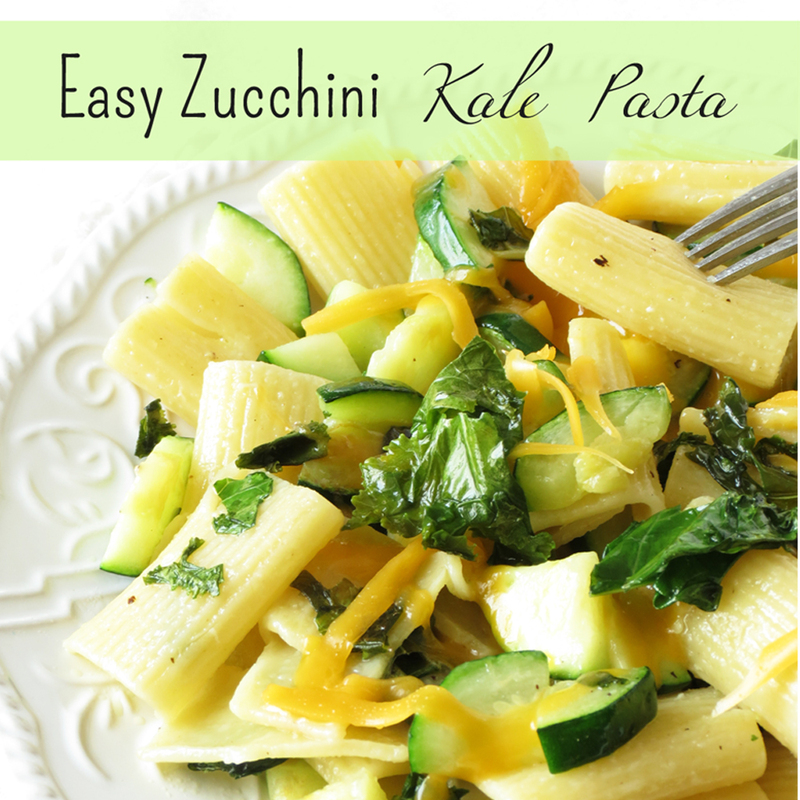 Then I made a salad and in the end I made this easy zucchini kale pasta. Zucchini is my favourite veggie lately, so I already knew that it will go well with kale. This recipe is so simple you just need saute veggies and pasta together in butter for couple minutes and whole dinner is ready. Preparing of this kale pasta took me maybe less than 30 minutes and I’ve added some shredded cheese on top to make it even more delicious. My kale pasta I kept vegetarian. However, if you prefer adding some chicken, pork beef or any other meat you can certainly do. Sometimes, I just like to have meatless dinner once in a while. Melt butter in the frying pan. 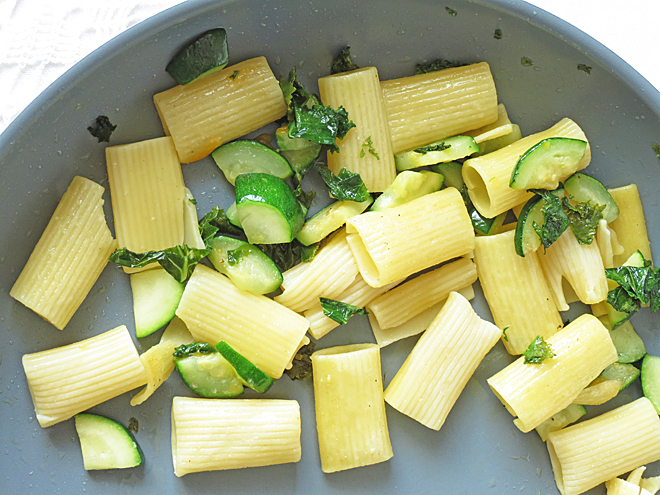 Add zucchini, kale and pasta. Season and cook on low heat for 5 - 10 minutes. Serve hot with shredded cheddar cheese. How do you like to eat your kale; Raw or Cooked? Pinned this! 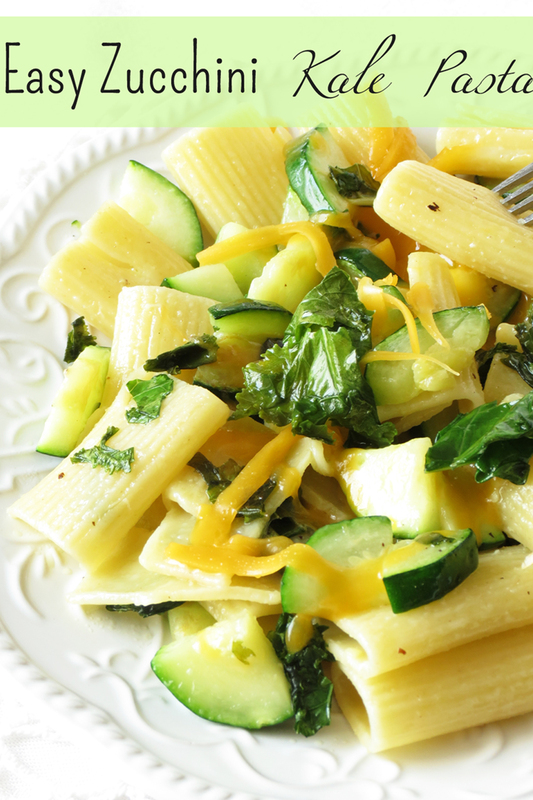 I buy kale but then don’t know what to do with it – and I just about always have some pasta and zucchini on hand so this will be perfect! Mmm! 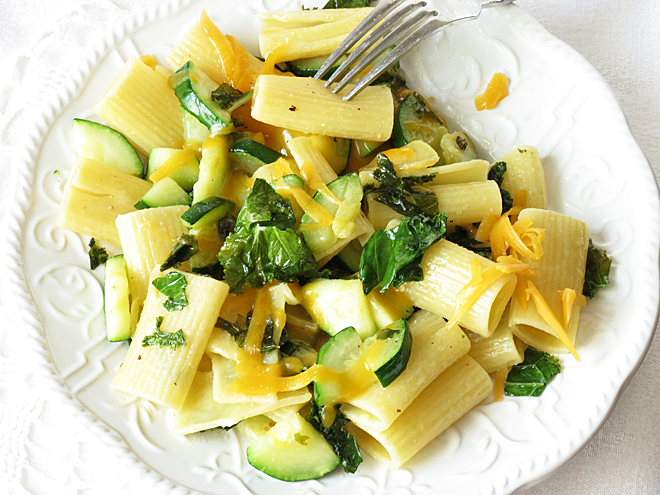 one can never have too many zucchini recipes this time of year! Zucchini is such an awesome vegetable isn’t it Audrey. It has a way of making any dish extra fresh 🙂 Enjoy the recipe. I got hooked on kale a few years ago, everything from kale chips to salads to stir fries.